Complete your upgrade now to comply with the revised trainer & assessor credential requirements which come into effect from July 1 2019. By upgrading to the new TAE40116, trainers may be better equipped for future legislative changes to training and assessment credential requirements. Novice or new Assessment writers who hold the TAE40110 and wish to upgrade to the current version. Our specialised 3-day course for those with little-to-no experience in assessment design is the ultimate value for money for those looking to complete their upgrade before the ASQA July 1st deadline. Do more in-class and spend less time navigating the course on your own. Book your course now and secure your upgrade before the deadline. Gain the ability to contextualise and give feedback on assessments. After noting the excessive out-of-class time and number of re-submissions often required by novice writers undertaking shorter versions, we designed this 3-day program for those with little-to-no writing experience, to ensure the in-class time sets participants up for success out-of-class. This face-to-face delivery allows participants to be guided through more of the design and development processes in-class, and affords more in-class time for planning and commencing the development tasks. Also longer in duration, it affords more time for competency development and consolidation and application of the learning. Students are required to pay the full fee at time of enrolment, or an invoice may be sent to your school/organisation. For more information or clarification, please contact us. *This is a rough estimation. The amount of time required will vary depending on the individual and multiple factors such as previous experience, current level of skill and knowledge, and ability to integrate assessment tasks with normal work activities. Assuming no prior skills or knowledge, we encourage participants to allow up to this estimated amount of time for all program commitments. This program is specifically designed for those with previous delivery and VET knowledge, ensuring that the existing knowledge and skills are acknowledged and the focus is on learning and skills not currently held by the participant, creating a tailored learning experience. Face to Face support and clarification for the tasks that need to be completed outside of class time. Access to eLearning, videos, learner guides, structured learning activities to ensure a holistic learning experience; setting up each learner to become an exceptional Trainer. Genuine support provided to give the participant every opportunity for a successful outcome including face to face support sessions provided at no additional cost as well as webinar, phone and email assistance from a trainer. Practical tasks; real candidate assessments, real resource development, validation activities etc. Other project tasks; assessment plans, special needs plans etc. Select your course from our offering. Decide what suits you/your group better– face to face or online training. Make sure you have everything you need for a seamless enrolment process. Make sure you have your credit card ready, or, if your school, RTO, employer or organisation will be paying, you will need to declare that you are authorised as a representative to apply for this course and 100% of the fees for this course will be covered by your school or organisation. Now that you've completed your enrolment process, you may login to your dashboard and view your training resources. If you have opted for online training, you may begin your training immediately. TAE Training Academy will issue your certificate upon successful completion of your online or face to face training. Before you start make sure you have the following items ready and on hand, for a smooth registration and enrolment. A digital copy of your most current CV that you can upload. Note: if you are applying for a TAE40110 to TAE40116 upgrade you will be required to upload certified copies of your full TAE40110 qualification and record of results/statement of attainment. If your school or organisation will be paying, you will need to declare that you are authorised as a representative of your school to apply for this course and 100% of the fees for this course will be covered by your school or organisation. 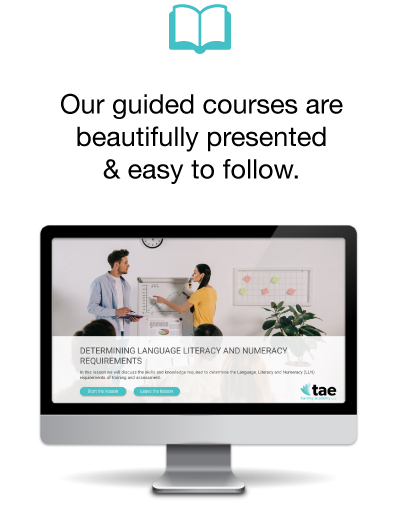 Group bookings can be completed onsite at your school, RTO, employer or organisation or at the TAE Training Academy Headquarters. Minimum numbers required for onsite group bookings. Contact us for pricing & more information. 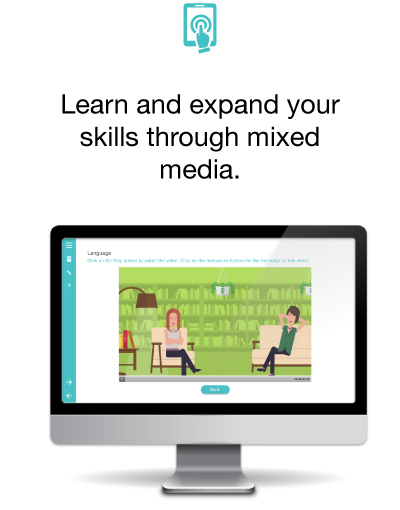 Our guided eLearning resources walk you through the course. The materials are easy to follow, interactive, and make it simple to learn at your own pace.